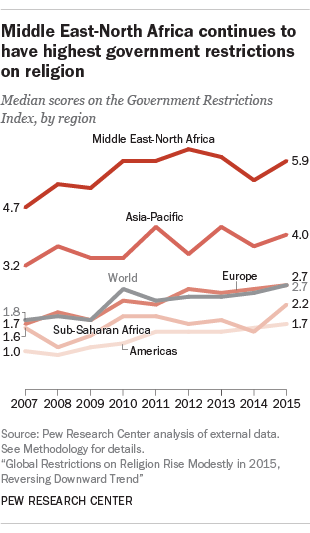 The share of countries with “high” or “very high” levels of government restrictions – i.e., laws, policies and actions that restrict religious beliefs and practices – ticked up from 24% in 2014 to 25% in 2015. 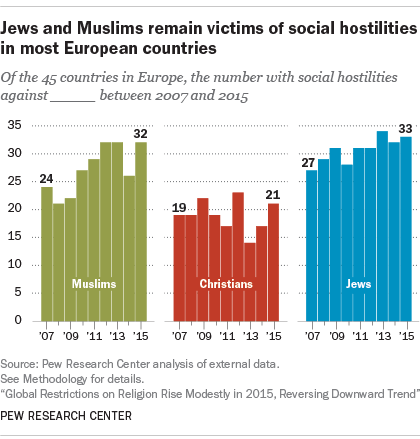 Meanwhile, the percentage of countries with high or very high levels of social hostilities – i.e., acts of religious hostility by private individuals, organizations or groups in society – increased in 2015, from 23% to 27%. Both of these increases follow two years of declines in the percentage of countries with high levels of restrictions on #religion by these measures.